More expensive premiums, higher excesses and narrower coverage are set to become an insurance reality for many Australian businesses. Here’s how SMB’s can prepare for a hardening market. Australian businesses have benefited from a soft insurance market for some years now, but it’s time to prepare for a change. We spoke with Steadfast Broker Technical Manager, Michael White about the cyclical nature of the market, the factors that drive it and how you can prepare for a harder market. What is a hard or soft insurance market? The nature of the market is driven by the availability of insurance, explains White. “If there’s a lot of capital coming into the insurance market, it’s easier to get cover – so in a soft market insurers will chase business,” he says. A soft market can therefore mean lower insurance premiums, discounts, broader coverage, smaller excesses, narrow exclusions and insurers writing more policies with higher limits. A hard market, on the other hand, is experienced when there is a decreased availability of insurance capital. With decreased availability can come higher premiums, lower policy limits, bigger excesses, wider exclusions, narrower policy coverage and less competition between insurers. Certain parts of the Australian insurance market are showing signs of hardening already. “We’re certainly seeing insurers not supporting certain kinds of risks such as for directors and officers generally, but in particular, D&O Side-C coverage for investor claims,” says White, referring to products that protect companies from claims made against it and its directors and officers. High-risk property is also becoming harder to place. “These are property risks where they have a lot of issues around the building – buildings that are unoccupied, poorly maintained or generally in a distressed condition,” White says. Professions and businesses with a history of losses are also likely to find it harder to secure the kind of coverage they’re seeking, White adds. The two main ways you can take advantage of a soft market are through locking in savings on premiums and excesses, or by securing higher policy limits or broader cover now if you will need it later. “For example, if you have cover for $5 million and you know you are soon going to need it expanded to $10 million, it may be easier to get now and cheaper in the long run,” White says. Your insurance broker may also be able to lock in future renewals on a favourable basis. There are two main ways in which you can ready your business for a hard market. The first is by factoring in increased costs. If you’re aware of the cyclical nature of the insurance market, you have probably been taking advantage of its current state and may have prepared by saving for the inevitable: more expensive premiums, higher excesses, lower policy limits or narrower coverage. If not, start factoring in these costs now. The second way is by having a long-term relationship with a good insurance broker. No matter what stage of the cycle the market is at, a good broker will understand it and your business, have good long-term relationships with insurers and be able to secure you the best cover for your individual circumstances, as well as being able to advise on likely future changes to insurance costs. A good broker is also invaluable in a hard market when policy wordings are narrower, limits are lower and excesses are bigger – as we’ve previously discussed, brokers can be your advocate should a claim be rejected. For expert advice on insuring against the risks your small business faces, talk to us today. 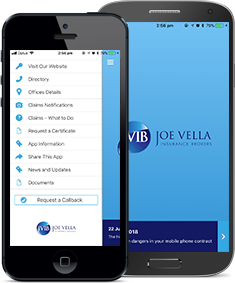 The JVIB app has lots of features with some really useful tools so when you need us, especially at claim time, we are right there for you, on your phone – 24/7.